Just returned from a Bay Area business trip, and I'm still feeling a bit underwhelmed by my recent spate of food and drinking experiences in San Fran. 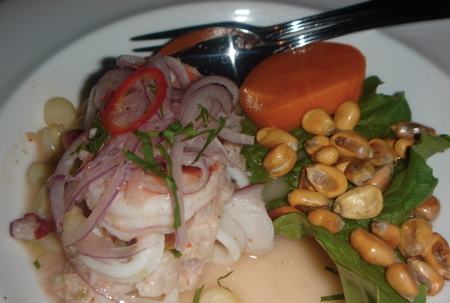 The Mission District held its own when I visited the Peruvian stalwart Limon, where I enjoyed a generous portion of their Limon Ceviche (pictured above), a fresh jumble of seafood cooked in a lime-infused dressing that left a pleasant pucker as the Pacific Corvina, shrimp and squid slid down my throat. It was a good. Very good. Not great though. The Dungeness Crab Salad with Haricot Verts, Grapefruit, Mango, Arugula and Citrus Vinaigrette at the Marina District's French-Japanese fusion restaurant Isa was nice. Very nice. Not great though. Same could be said for the Cheese plate at Nectar Wine Lounge next door. I've visited San Francisco before. This is town from whence I expect great. So, on Friday night I was excited to be paying call on one of the city's hottest culinary tickets - Myth. Considered a gem among San Francisco's new dining rooms, I couldn't wait to enjoy a late supper at this Jackson Square haunt. My review? The room was lovely. The food was tasty. The help was verging on hostile. 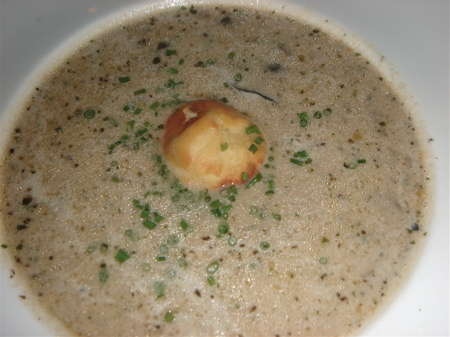 It was a gorgeous dish, rich and heady with the perfume of earthy truffles. The addition of a light pastry puff filled with soft, creamy goat cheese bobbing atop was genius. But it's hard to truly savor this sort of treat when your waiter is staring you and your table down, counting the seconds until you leave. Now I realize that San Francisco is an early town. Most restaurants close around 10:30pm - on a weekend night - but this was ridiculous. We had made a 10pm reservation. The kitchen was supposed to accept reservations until 10:30pm. There was no reason for the staff to make us feel uncomfortable and unwelcome for arriving at that hour. Yet, throughout the meal, the evil glares from the staffers were hard to ignore. Beautiful setting, wonderful food and entertaining company aside, I was happy to finish our meal and get the heck out of Myth. Next time I visit the Bay Area, back to Zuni Cafe I go. How I didn't go this trip, I don't know. It may sometimes take a while to get a table, but the food is always amazing, the room comfortable - and most importantly, the kitchen open until 1am and the staff ever gracious.